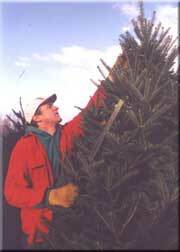 Enjoy a fresh cut, full and excellent shaped fir in your home. The traditional family tree. Noted for superior needle retention and holiday fragrance. Trees shipped in boxes made for this. Watching one go into the box at the farm is amazing, as is watching it emerge at your home! Branches relax to full size shortly after opening. *See order form for additional shipping information.